Contact: Norma Center – ncenter@esng.org or 404-569-0157 for questions and to sign up. Come share the love on Valentines Day! We welcome families of all ages to do a book drive for children age 6 weeks to 5 years. Please bring your books and write a short summary of how you did your drive. We will place you in a classroom so you can share your books with the children. We are all about literacy! If you have multiple family members and they are all able to read to the children, we will keep you in the same class. We have 20 classrooms, so we feel we can accommodate a good number of volunteers. 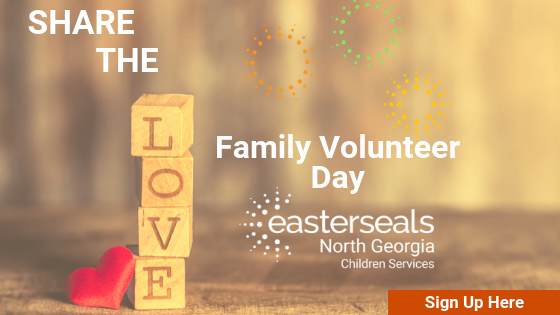 If we have such a large number of volunteers, we fill up all classrooms at this location – we can schedule more volunteers at any of our 5 other Metro Atlanta Easterseals Child Development Center locations. If you have a large group and you want to set up a volunteer literacy day – we can accommodate up to 100 at 1 location. Sorry, no court-ordered volunteers or those with a criminal record. We believe that all children have a genius inside! It’s Valentines Day… so share the love! We encourage you to engage with our kids, make them feel special! When you read to them, they are likely to want you to look at them, ask them questions about the book. Be animated, laugh, move around – the more you interact with them, the more they interact with you. You can be the spark that makes them want to know more and continue their reading journey. If you have an age-appropriate (1 year to 5 years) activity to do that can go along with the book such as a play, song or coloring page, etc… the kids love connecting what they have learned with activities – so think outside the box and come prepared to shine and make a difference in our children. Encourage them to read – write the class after your volunteer experience and stay in touch – it will keep them wanting to read and get them ready to learn for Kindergarten. Please do not park at front of building, park at the 2nd entrance where you see Easterseals North Georgia sign. Enter at back entrance by 9:00 am for greeting everyone and then get you to your classroom.